The Miami Heat completed the 4-1 first round series win over the Philadelphia 76ers last night by 97-91. This means that the second round series between the Celtics and Heat will begin this coming Sunday. After beating the Heat in the opening game of the regular season the Celtics will be looking to make the final game of this series the last of their post season ventures. The Celtics won three of the previous four regular season match ups this season. They did lose the most recent match up but will have no reason to fear the Heat coming into round two. Miami will hold a home court advantage but playing in front of Miami crowds shouldn't be a problem for the veteran laden Celtics. The Heat will have the best player on the court in Lebron James and even the second best player on the court in Dwayne Wade. Crucially however the Celtics have better depth and match up well to take advantage of the Heat's frailties. Rajon Rondo will once again be a key figure for the Celtics as the Heat have no true point guard. The Heat's so called starter is Mike Bibby but he plays minimal minutes giving way to the young Mario Chalmers. Chalmers is obviously a talented player but is nowhere near the level of Rondo. Rondo is one of, if not the, best point guards in the league. He will be able to take over this series if Chalmers cannot match him defensively because when he is hot the whole Celtics team benefits from good looks. 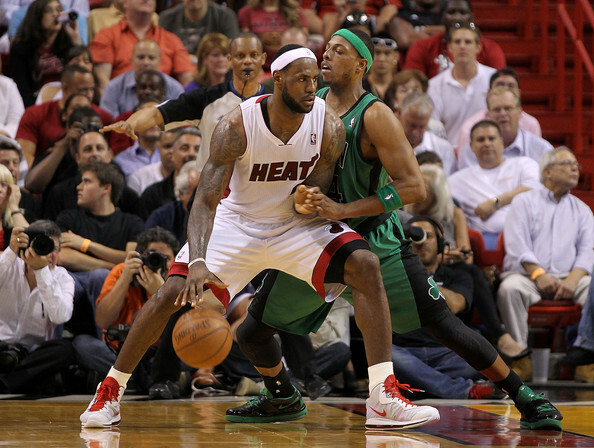 The Heat could potentially move Lebron James onto Rondo to try to stifle him but that would leave Paul Pierce with a favorable match up against whoever Heat coach Eric Spoelstra decides to move to small forward. Neither team has a great inside presence as their best big men, Kevin Garnett and Chris Bosh, are both jump shooters but expect Jermaine O'Neal and Joel Anthony to try to impose their physicality in the paint. The play of Ray Allen and Dwayne Wade will be a fascinating part of the game to watch. Both players are unbelievably good scorers while premiere defenders. Allen may be much older than Wade but shows no signs in slowing down as one of the fittest players in the league. The Heat's greatest weaknesses are at the point guard and center positions. Whether Shaquille O'Neal plays at all during these playoffs remains up in the air but at least the Celtics can use their advantage at point guard to advance to the conference finals.